I will never tire of twists on my favourite cocktail, the margarita. I like them with prickly pear syrup, grapefruit juice or a splash of O.J., and last year I was particularly enamoured with the Pineapple Ginger Margarita from Earl’s. 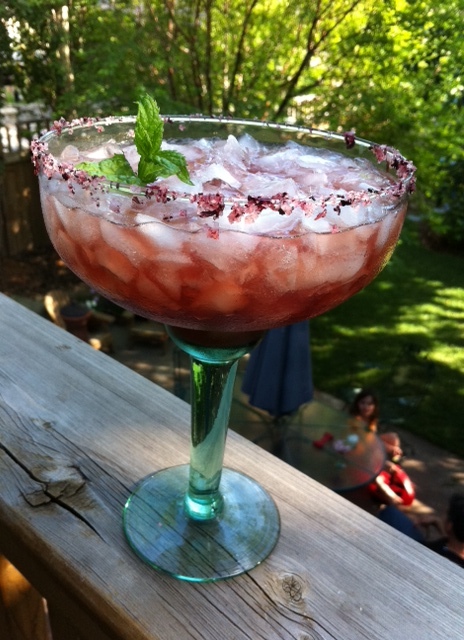 Today I bring you a Blackberry Margarita, whose star ingredients are tequila, blackberry liqueur or Chambord, and lime juice. Pretty in purple, the blackberry margarita tastes good too. Blackberries are just coming into season and I figured their sweet-tart taste would complement the bite of tequila and tang of lime. The colour is lovely too. We have loads of fresh mint in several containers just waiting for a mojito party; sadly, with a flood-ravaged basement, that summer day may never come. Instead, I am looking for different ways to add mint to cocktails. With tequila, it’s a bit unorthodox, but what the heck (if I’d had fresh blackberries on hand I would have muddled some in as well). In this cocktail the mint flavour is subtle, but as a garnish the aroma is enticing on the nose. And it makes for a pretty picture, no? Altogether this drink is good and just gets better as the ice melts. You really can’t go wrong with fresh mint, either muddled in your blackberry margarita, or as a pretty garnish (or both). Rim a margarita glass with salt and fill with crushed ice. Muddle the mint leaves in the base of a cocktail shaker, then add the tequila, blackberry liqueur, lime juice and agave nectar. 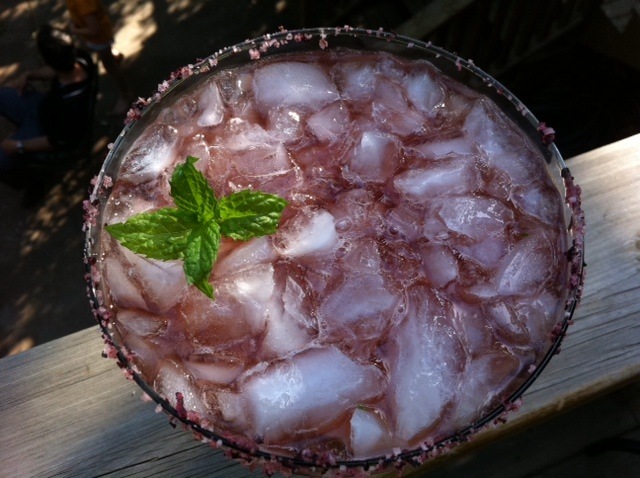 Add ice and shake, then strain into the margarita glass and garnish with the mint sprig.